Hot Club Sandwich’s new album features David Grisman Released Today! 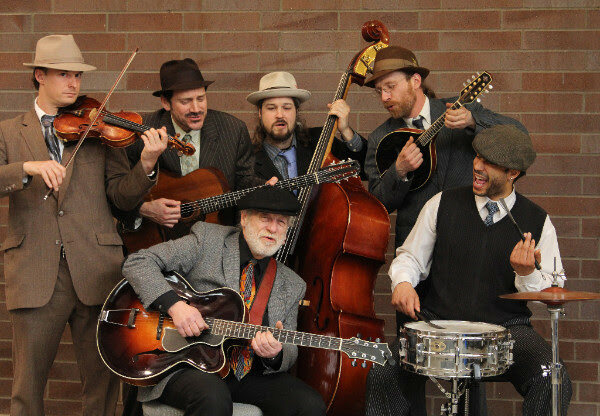 True Northwest originals, Washington State string swing ensemble Hot Club Sandwich has cooked up a delightful meal of new songs and tunes for their new release, No Pressure on David Grisman’s Acoustic Oasis label. For the new menu, Hot Club Sandwich happily pairs jazz manouche with a bolero romantico, or follows a Hoagy Carmichael song with a Peruvian waltz from the same era. Long ago, the band adopted its own interpretation of Django Reinhardt and Stephane Grappelli’s open-minded ethic in pursuit of honest, adventurous improvisation and an embrace of music forms from around the world. The group pays homage to other legends who flourished around the same time, such as Slim and Slam or Stuff Smith, but they also love the music enough to look to inspirations closer to home, like 75-year old jazz guitarist Ray Wood, who’s long been a key member of the band, and shares his vocal talents here for the first time. For No Pressure, Hot Club Sandwich’s fifth album, they invited longtime friend David Grisman to both share in the experience, and also help shape it. Grisman acted as producer (in the casual sense of the term), and Dawg generously offered input on everything from instrumental arrangements to production strategy, while also joining in on mandolin on half the tracks! Improvising a recording studio in a old Victorian in Port Townsend, WA, the band created a comfortable, creative workspace for two weeks, with slow-food simmering in the kitchen and racks of outboard gear in the dining room. In the big room, the woodstove glowed where the band played. Hot tunes for snowy winter nights, and you can hear the camaraderie and the stellar musicianship in the new album. No Pressure also incorporates two songs from the collection of Ray Wood, and his songwriting partner Vann Cantin, drawn from the duo’s musical, The Alligator Circus. Wood sets the scene for a back-porch cook-out with bluesy jazz with his delicate, intentional touch on the guitar and gentle vocals. In a similar spirit, the hot-footing “Blackpot Coozie” is a new song from Sircely, inspired by his annual pilgrimage to the Blackpot music camp and festival in Louisiana’s Cajun Country. No Pressure captures the essence of Hot Club Sandwich’s recent five-year period with Joseph Mascorella on drums and vocals while also spotlighting the work of founding members Kevin Connor on Selmer-style guitar, James Schneider on bass, Sircely on mandolin, and Tim Wetmiller on violin. The final track on the album, a striking cover of “St. James Infirmary,” features vocals from Tracy Grisman, also creator of the album’s cover artwork. With so many influences, it can be hard to pin down this band’s genre, but eventually it becomes clear that there’s only one dish on the menu: a Hot Club Sandwich! « VICTOR WAINWRIGHT and the TRAIN is the Spotlight Album.